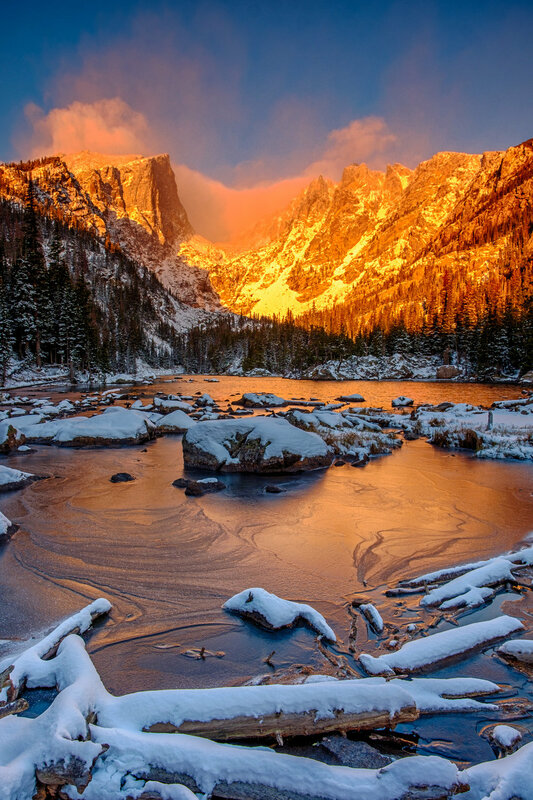 Everyone should visit the Rocky Mountain National Park in Colorado at least once in their lives, if for nothing else than to see some variation of this beautiful scene at Dream Lake... they obviously call it "Dream Lake" for a reason! 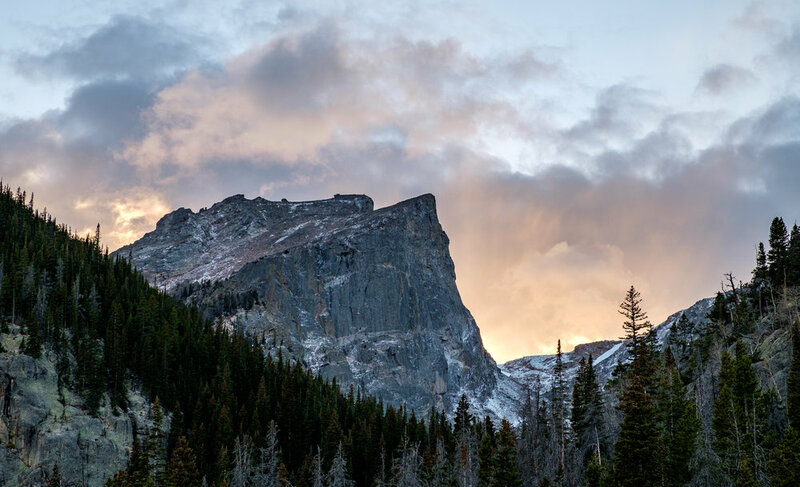 70 miles northwest of Denver, somewhere between 8,000 and 14,259 feet, exists one of the most comprehensive ecosystems in all of America’s national parks – that's not a huge surprise considering the range of natural features born of meadows, forests, lakes, tundra, glaciers, and rugged mountain peaks. 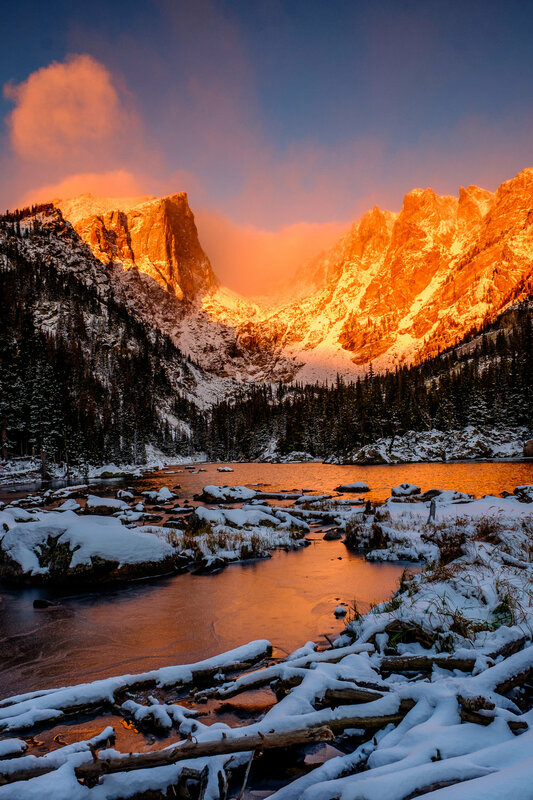 It is such diversity that makes Rocky Mountain National Park one of the most actively explored in the system. 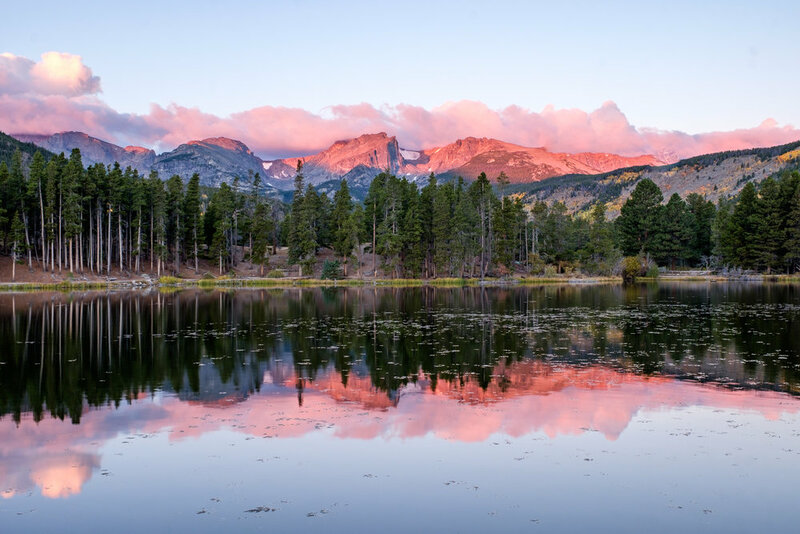 For the low-key, there are plenty of lazy strolls and leisurely drives to be had; and for visitors who are out there to go bigger – hiking, mountaineering, searching for wildlife, taking photographs, rock climbing, horseback riding and other active adventures are all ready for the grab in Colorado’s favorite mountain wilderness. 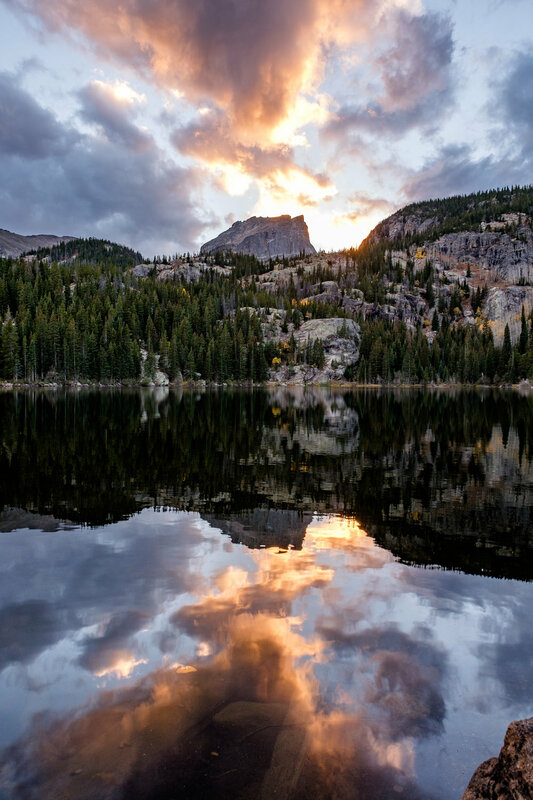 For this article we are going to neck down on some of the aspects of America’s 10th national park that made the biggest impression on us when we visited there in early October. 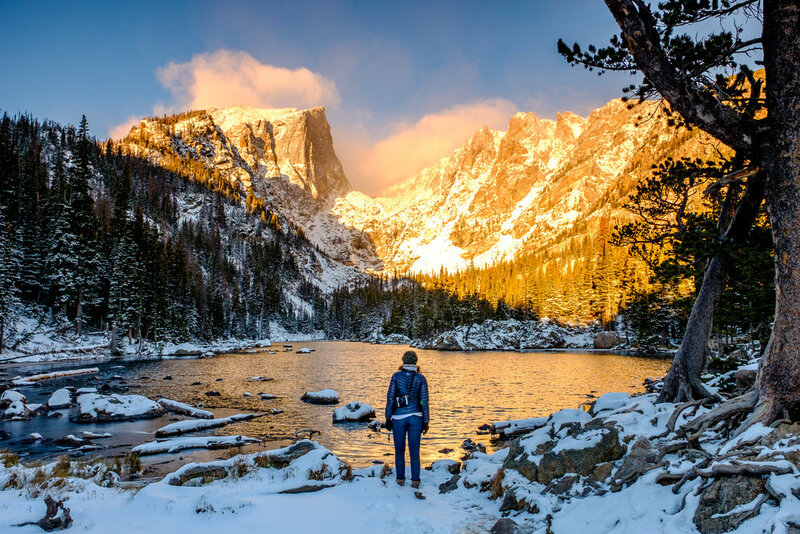 We hope that it will help you plan your own trip to the Rockies this year. Enjoy! 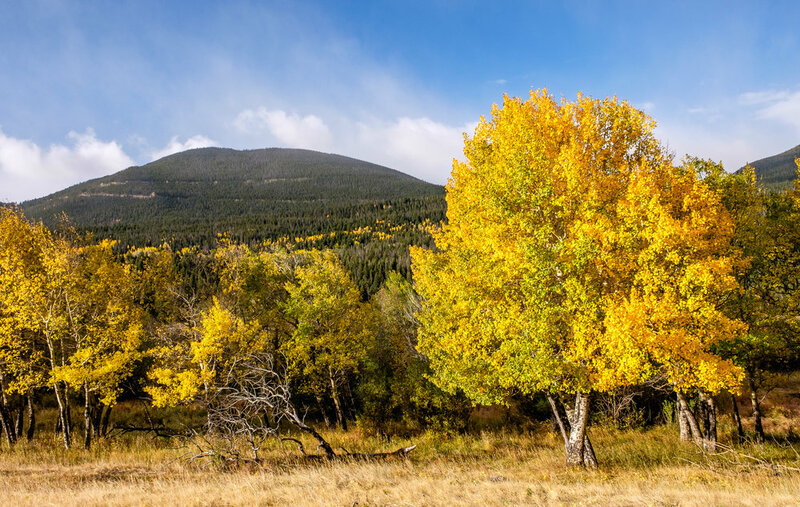 Colors burst from aspen trees throughout the park. 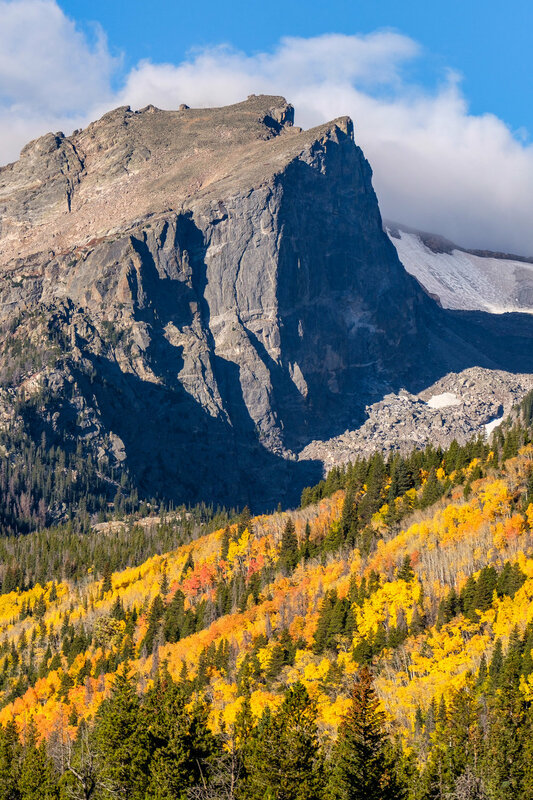 Autumn in the Rockies is a beautiful time of year and is a really interesting time to visit. Crowds have thinned from the summer hoards, making way for large herds of elk that can be spotted across vast meadows during their annual breeding season. Dominant males command harems of females while battling other males that get in their way; herding, locking of horns, defiant females... watching their behavior is endlessly fascinating. Mating season is called "rut" which translates from Latin as roar, denoting the call of the bugle that lingers hauntingly across the landscape. 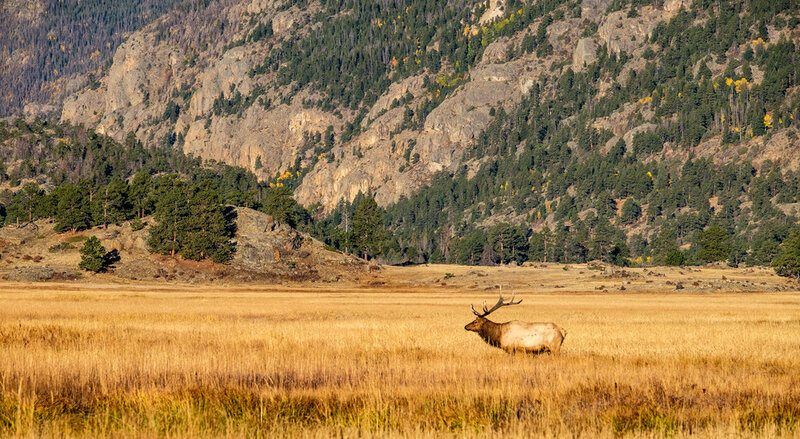 In nearby Estes Park, located 11 miles from the park entrance, an annual festival celebrating elk populations in Colorado takes place each year—a sort of Elk-Palooza, with beer gardens, educational programs, and plenty of family-friendly activities.This flurry of activity devoted to the North American elk has earned the month of October the name "Elktober" in the Colorado Rockies. 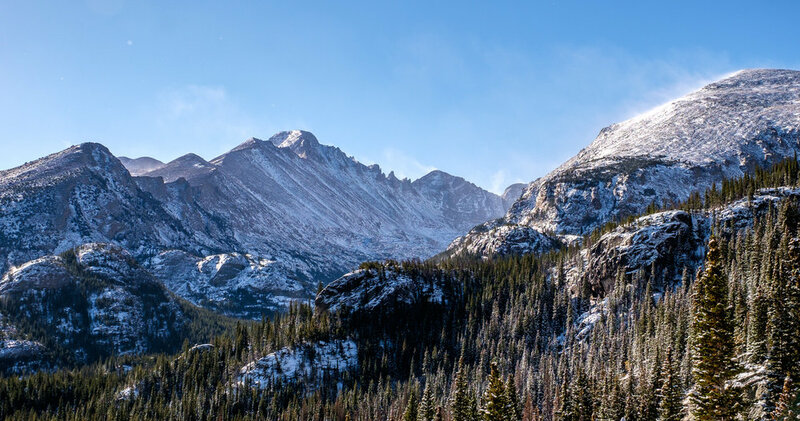 Built in 1920, Old Fall River Road was the first of its kind in Rocky Mountain National Park, created so that automobiles could travel into higher elevations. 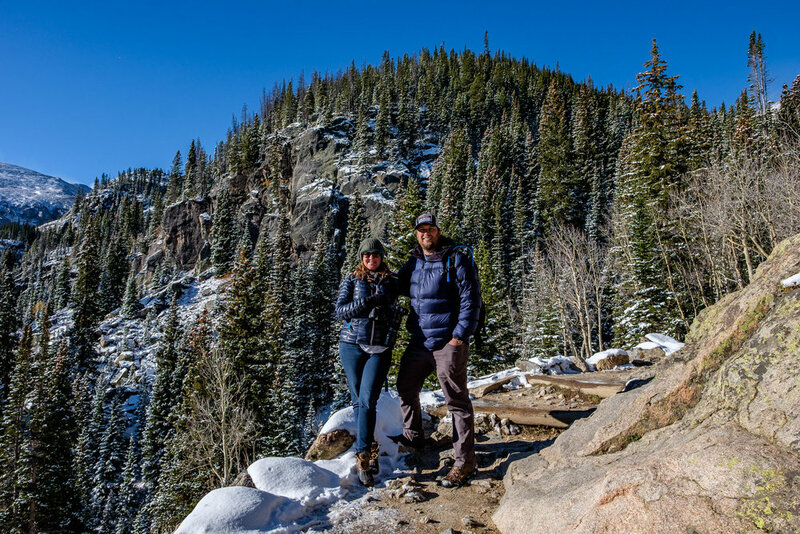 It remains more primitive than Trail Ridge Road, and is often referred to by the park as a "motor nature trail." 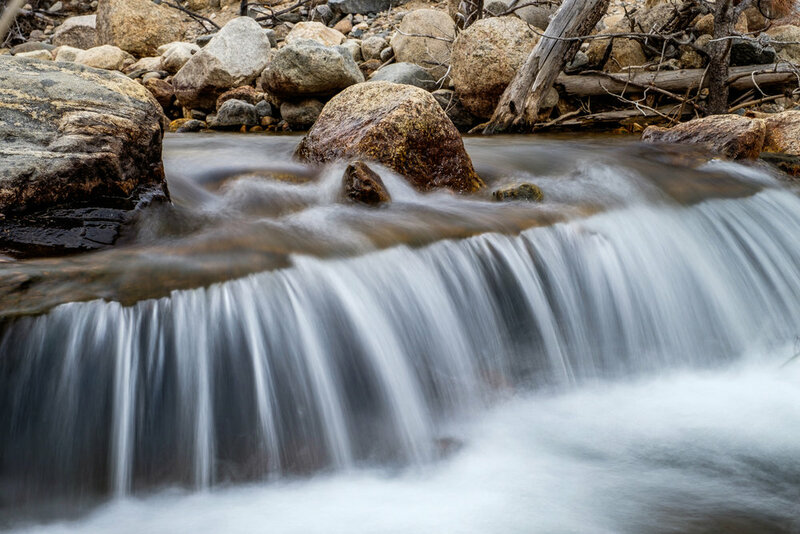 The 11-mile long road has no guard rails and posts a speed limit of 15 miles per hour, so bring your patience with you—and your camera... the intimate nature of this trail provides shelter to plenty of wildlife. 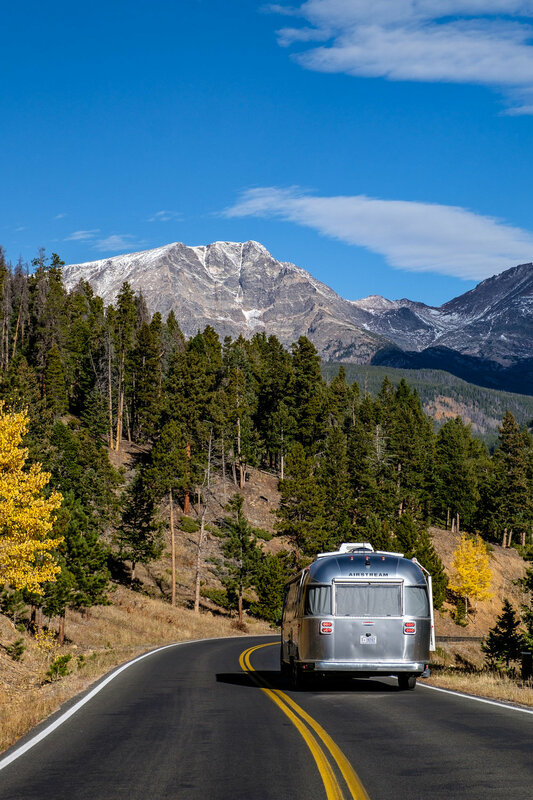 The road meets up with Trail Ridge Road at the Fall River Pass. "On top of the world, pretty rad, right?" 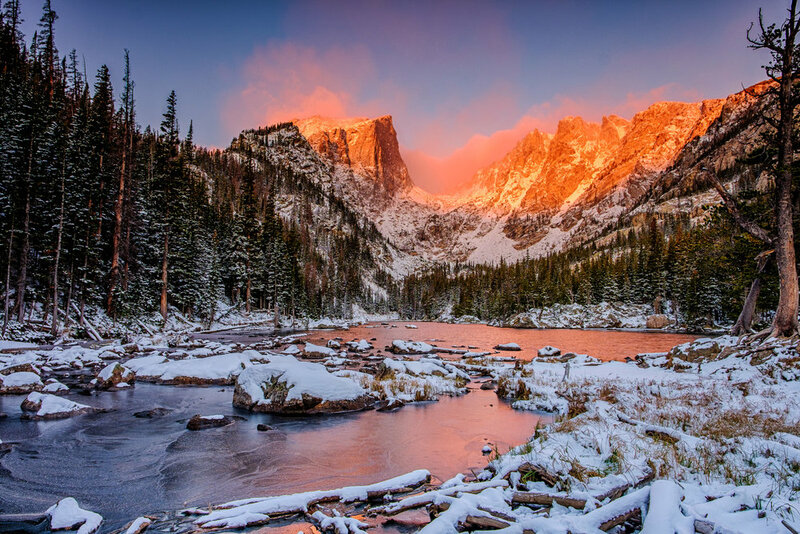 How the park got its name: Rocky Mountain National Park was named for the mountain range in which it occupies more than 415 square miles of. 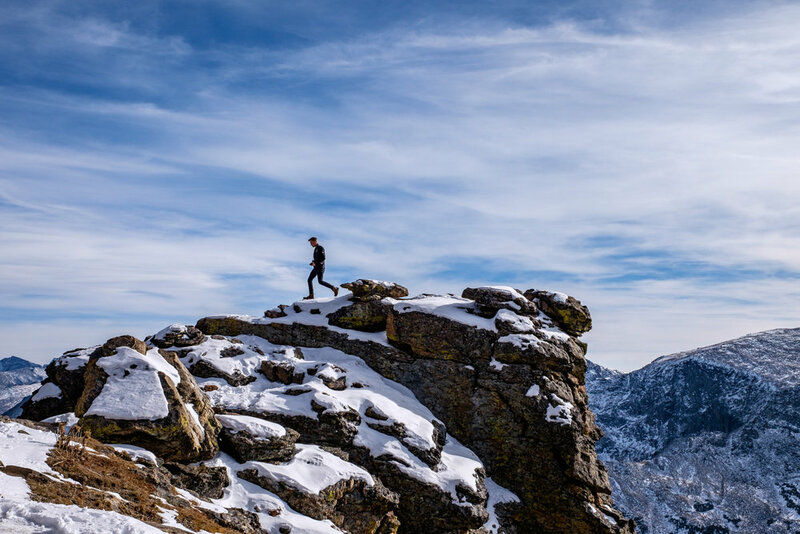 The name of the range was given by explorer Legardeur St. Pierre in 1753 when he wrote of the peaks in his journal, calling the mountains Montaignes de Roche translating as "Rocky Mountains." Long before that, the Cree Indians who inhabited the land east of the mountains called them as-sin-wati, which translates as the same. 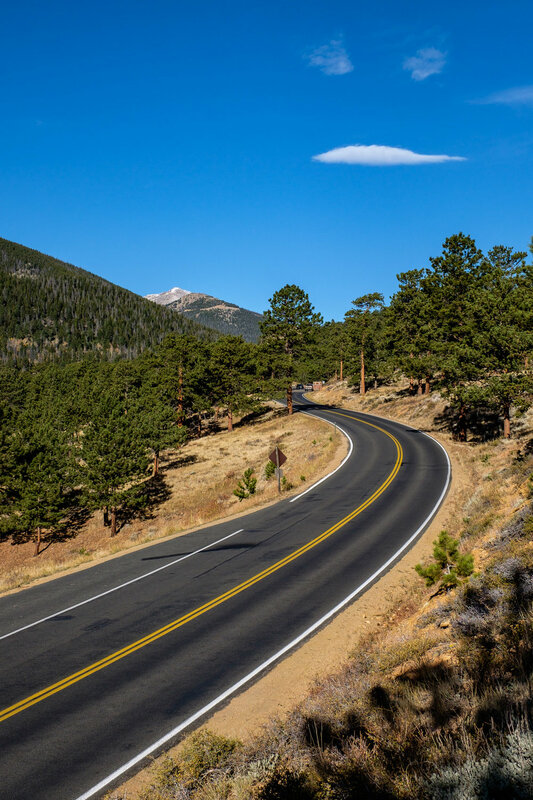 Iconic site in the park: In 1932, Trail Ridge Road (U.S. 34) opened to visitors, providing a highway to the sky. 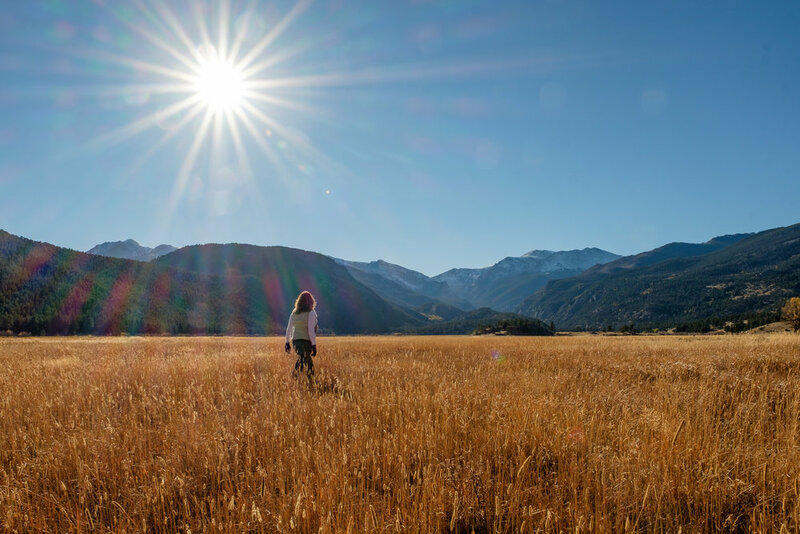 Upon its completion, Horace Albright, then director of the National Park Service said: "It is hard to describe what a sensation this new road is going to make… You will have the whole sweep of the Rockies before you in all directions." He was right. 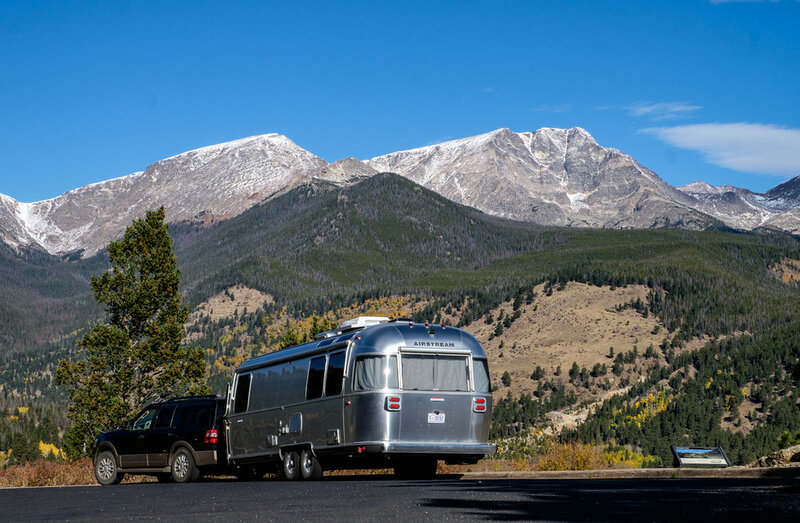 From the comfort of your car you will travel through aspen and ponderosa pine forests in the lowlands that eventually give way to alpine forests of fir and spruce in the sub-alpine regions where diverse wildlife habitats thrive. 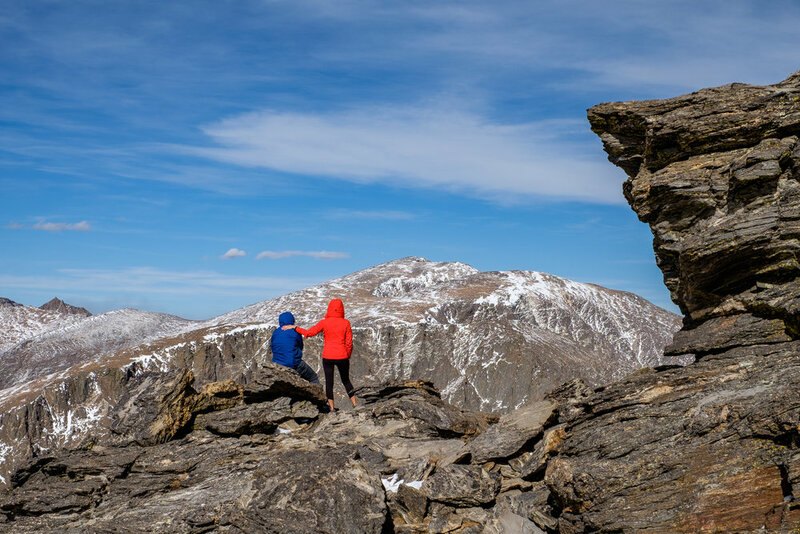 As you reach the alpine tundra and the highest point in the park accessible by car at 12,183 feet, you'll find yourself on top of the world and in the clouds. 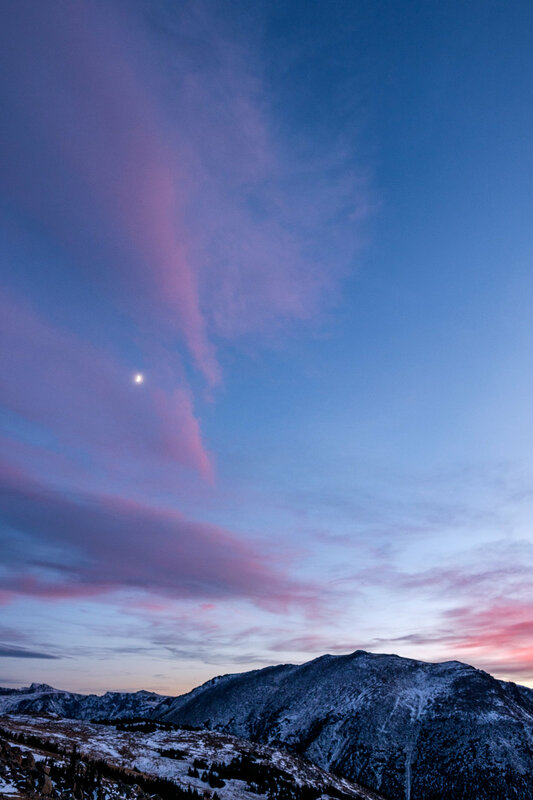 Beautiful mountain views sweep in every direction along the 48-mile long scenic road. 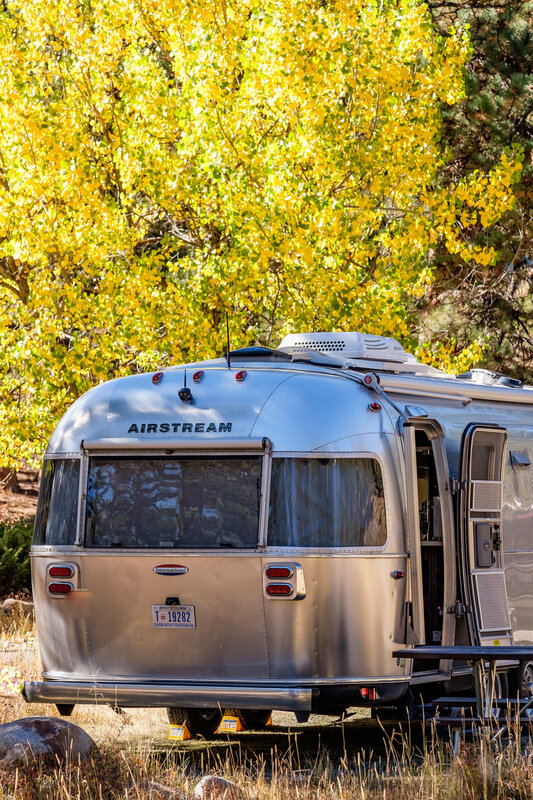 While you can technically get through the drive in a couple of hours, you might want to plan for an all day outing as there is much to experience and plenty of trailheads to stop at along the way. 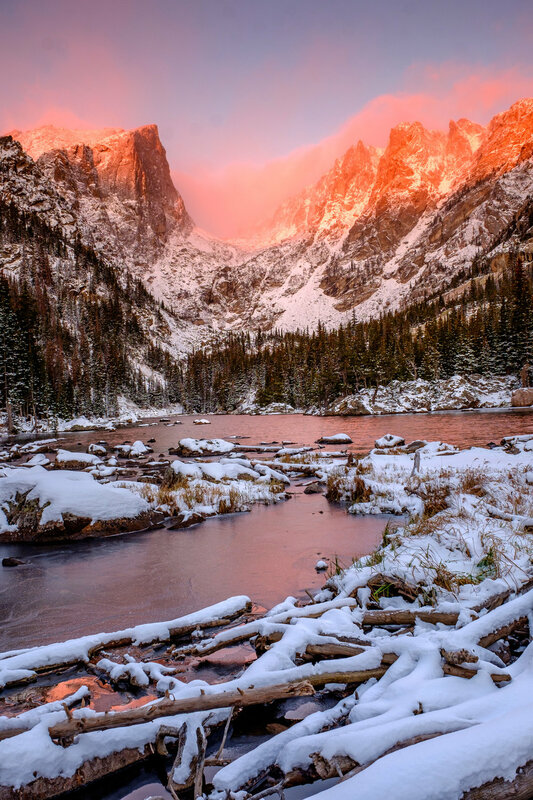 Accessible adventure: Bear Lake is the most visited point-of-interest in the park. 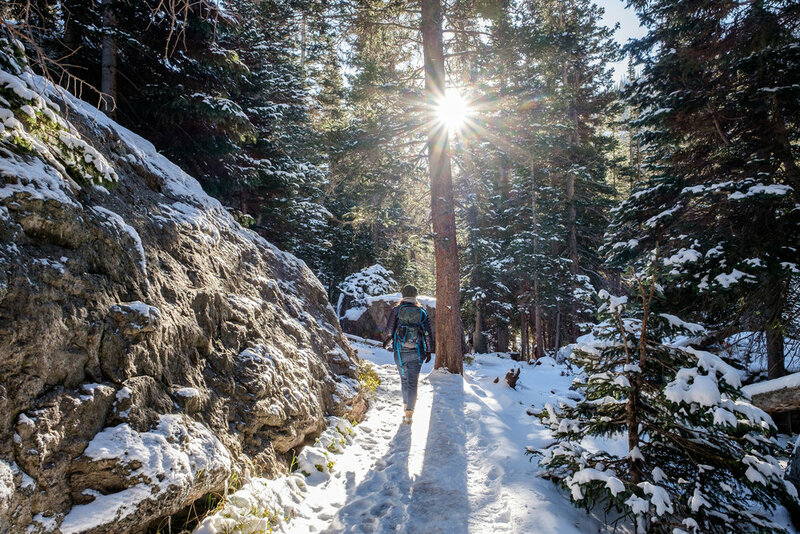 The 0.6 mile interpretive loop trail wrapping around it has no real elevation gain to speak of making it an easy stroll for adventurers of all skill levels. 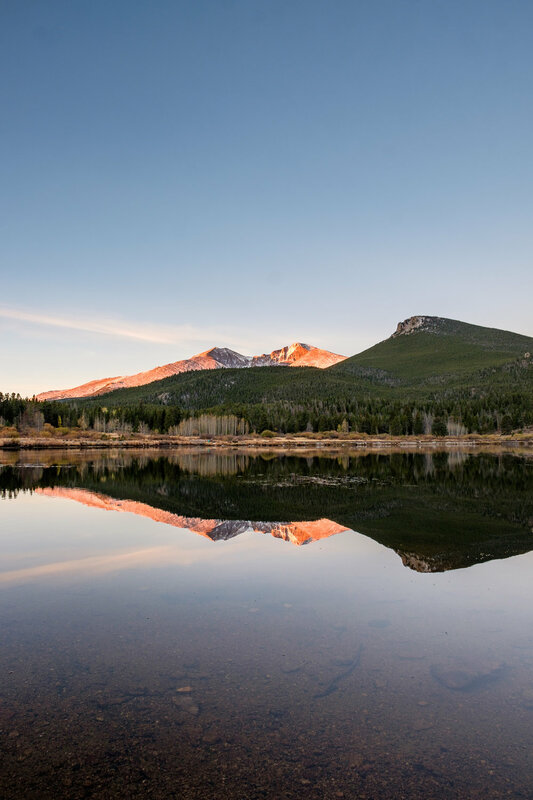 If you hike the trail counter-clockwise you can pick up an interpretive guide provided by the Rocky Mountain Conservancy at the start which offers information about 30 marked spots detailing the area's history, geology, and landscape. We recommend taking the free shuttle during peak season as to ease congestion (not to mention that finding parking can be impossible.) 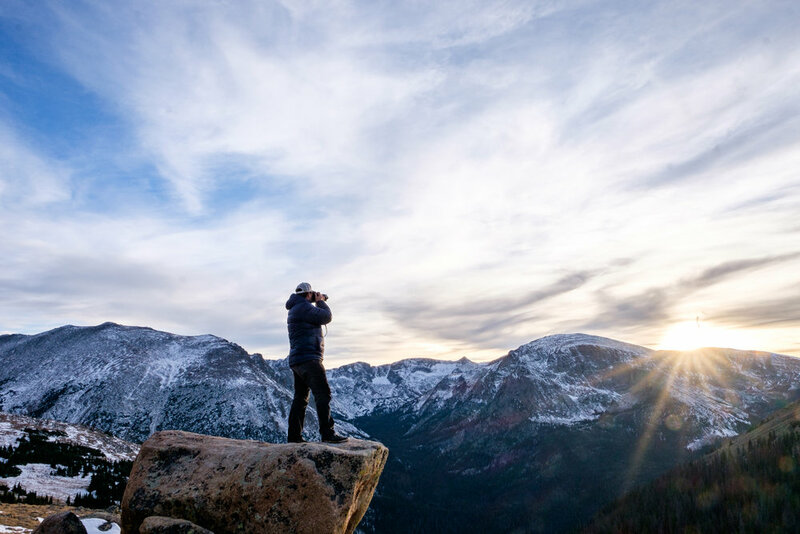 If you head out at dawn, you will enjoy the feeling of quiet solitude and stillness as crowds tend to flock in the late morning and during the afternoon. 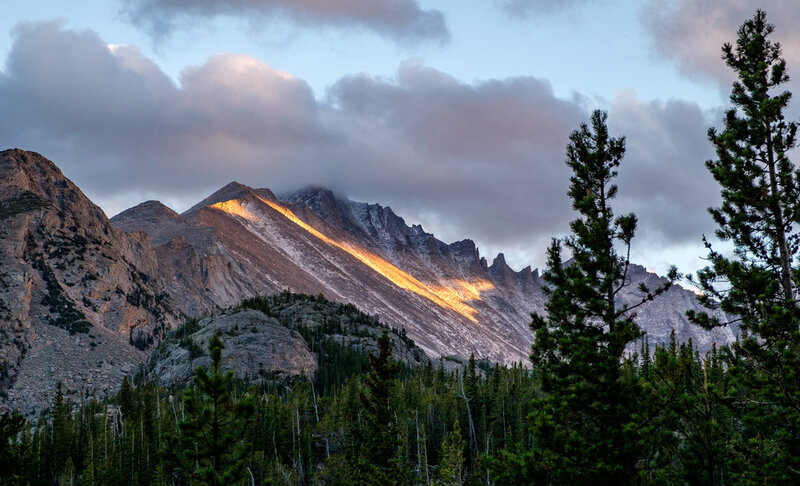 Long's Peak as seen from the east side of the park. 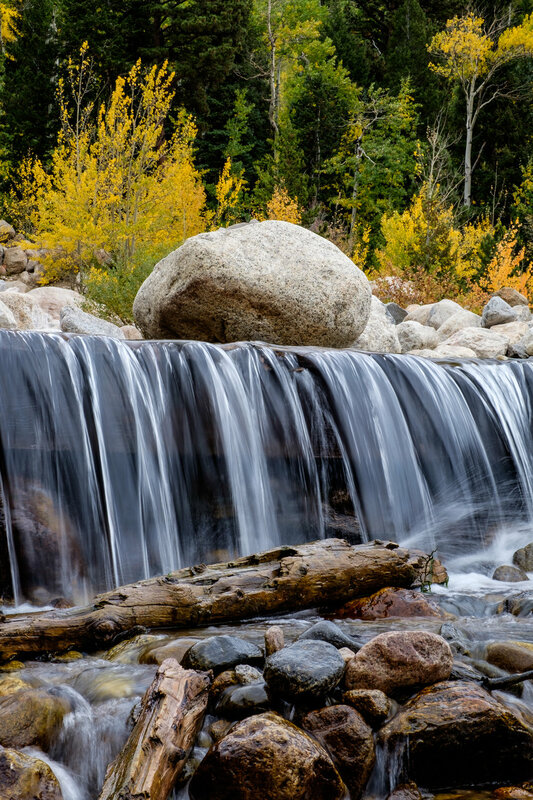 Roaring River Waterfall at the Alluvial Fan. 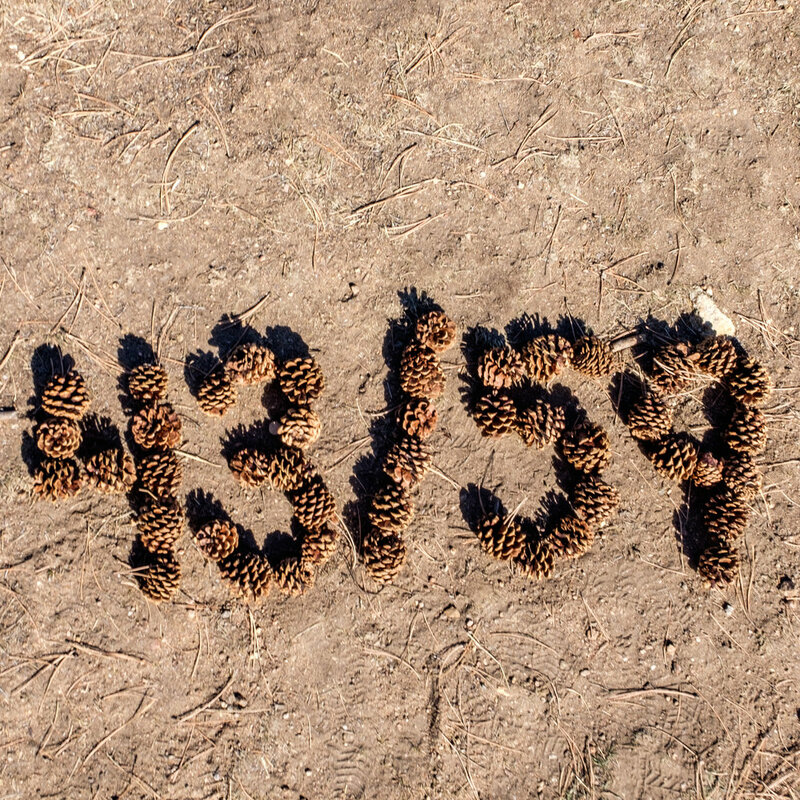 Don’t let anyone tout Colorado as a place with no water! 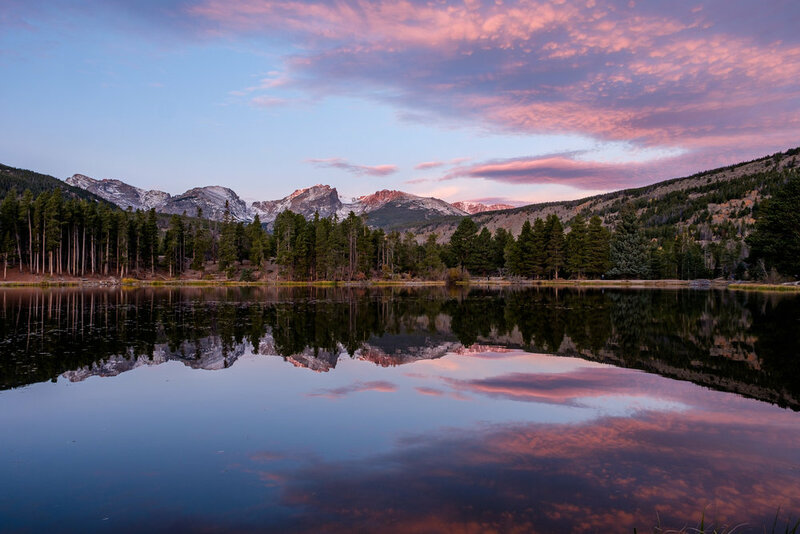 More than 2,000 rivers, lakes, and streams flow through Rocky Mountain National Park, creating endless opportunities to experience and photograph the state's beautiful mountain waterways. An elk bull rests in the lowlands. Isn't he beautiful?! 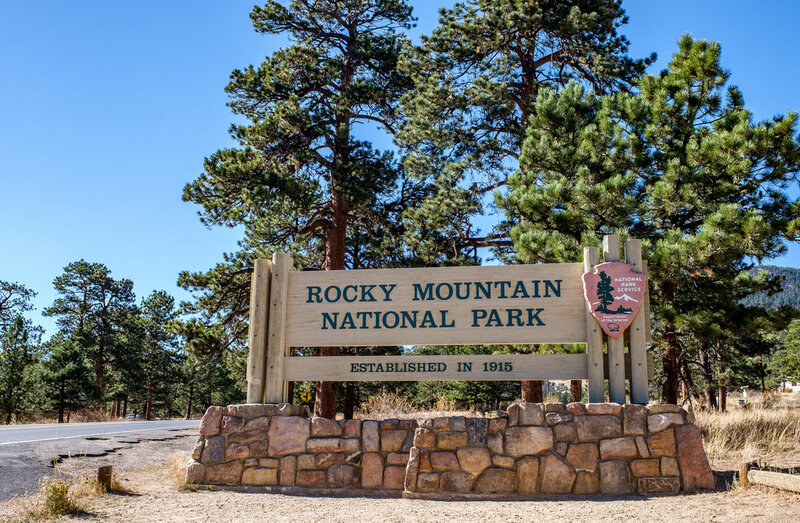 Rocky Mountain is the only national park with a cemetery within its boundaries. The Grand Lake Cemetery was built 23 years prior to the park's establishment, in 1892. 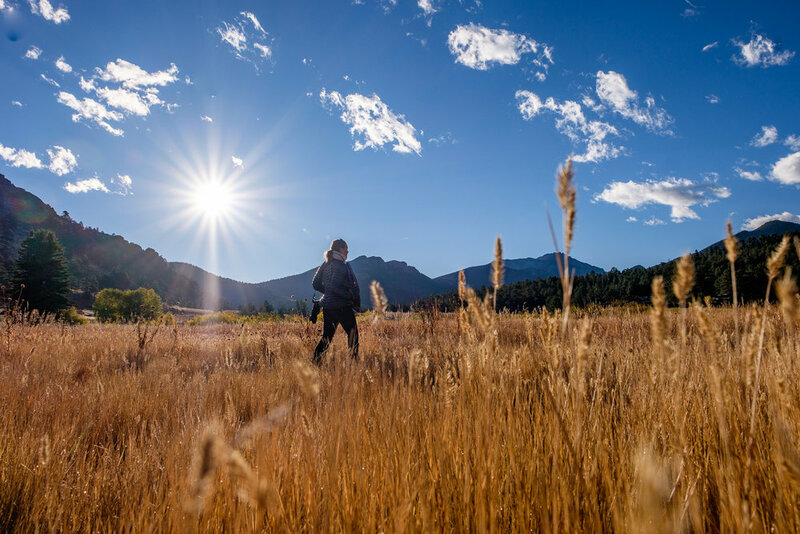 Cultural protection, preservation, and the sharing of Rocky Mountain National Park's history is a priority carried out by archeologists, architects, curators, historians, and other resource professionals in the park. 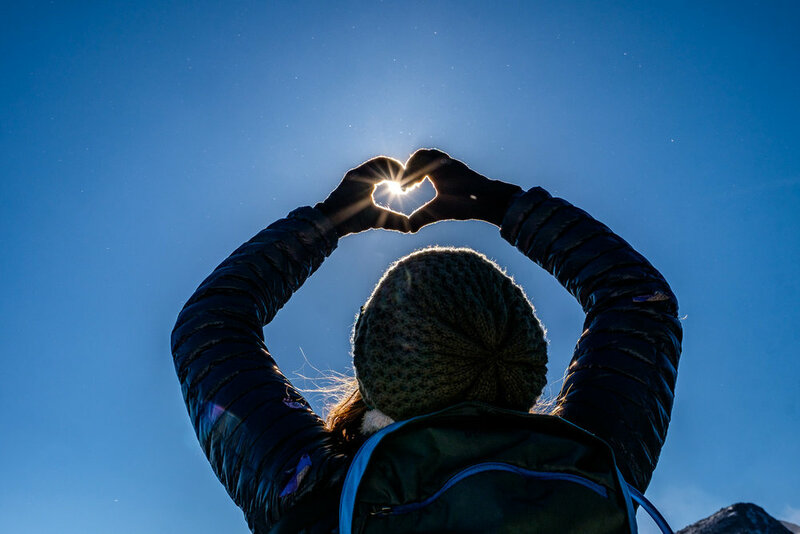 These efforts play a vital role in working with native American tribes, schools, local governments, non-profits, and others. Read more about this on the What We Do page on the park's official site. The Stanley Hotel in Estes Park inspired Stephen King's novel, The Shining. Unsurprisingly, it has a haunted history. The first detailed maps of the park were created in 1871 after Henry Adams surveyed the area and described it in print during Clarence King's Fortieth Parallel Survey. 150 of the 600 buildings within the park boundaries are labeled as historic structures. One of them is the Beaver Meadows Visitor Center, the park's headquarters. It was designed by Tom Casey who studied at Frank Lloyd Wright School of Architecture.